A biblical manuscript is any handwritten copy of a portion of the text of the Bible. Biblical manuscripts vary in size from tiny scrolls containing individual verses of the Jewish scriptures (see Tefillin) to huge polyglot codices (multi-lingual books) containing both the Hebrew Bible (Tanakh) and the New Testament, as well as extracanonical works. The Aleppo Codex (c. 920 CE) and Leningrad Codex (c. 1008 CE) were once the oldest known Hebrew language manuscripts of the Tanakh. In 1947 CE the finding of the Dead Sea scrolls at Qumran pushed the manuscript history of the Tanakh back a millennium from the two earliest complete codices. Before this discovery, the earliest extant manuscripts of the Old Testament were in Greek in manuscripts such as Codex Vaticanus and Codex Sinaiticus. Out of the roughly 800 manuscripts found at Qumran, 220 are from the Tanakh. Every book of the Tanakh is represented except for the Book of Esther; however, most are fragmentary. Notably, there are two scrolls of the Book of Isaiah, one complete (1QIsa), and one around 75% complete (1QIsb). These manuscripts generally date between 150 BCE to 70 CE. 52 papyrus, oldest copy of John fragments) to the introduction of printing in Germany in the 15th century. Often, especially in monasteries, a manuscript cache was little more than a former manuscript recycling centre, where imperfect and incomplete copies of manuscripts were stored while the monastery or scriptorium decided what to do with them. There were several options. The first was to simply "wash" the manuscript and reuse it. Such reused manuscripts were called palimpsests and were very common in the ancient world until the Middle Ages. One notable palimpsest is the Archimedes Palimpsest. If not done within a short period of time after the papyri was made, washing it was less likely since the papyri might deteriorate and thus be unusable. When washing was no longer an option, the second choice was burning. Since the manuscripts contained the words of Christ, they were thought to have had a level of sanctity; burning them was considered more reverent than simply throwing them into a garbage pit, which occasionally happened (as in the case of Oxyrhynchus 840). The third option was to leave them in what has become known as a manuscript gravesite. When scholars come across manuscript caches, such as at Saint Catherine's Monastery in the Sinai (the source of the Codex Sinaiticus), or Saint Sabbas Monastery outside Bethlehem, they are finding not libraries but storehouses of rejected texts sometimes kept in boxes or back shelves in libraries due to space constraints. The texts were unacceptable because of their scribal errors and contain corrections inside the lines, possibly evidence that monastery scribes compared them to a master text. In addition, texts thought to be complete and correct but that had deteriorated from heavy usage or had missing folios would also be placed in the caches. Once in a cache, insects and humidity would often contribute to the continued deterioration of the documents. Complete and correctly-copied texts would usually be immediately placed in use and so wore out fairly quickly, which required frequent recopying. Manuscript copying was very costly when it required a scribe's attention for extended periods so a manuscript might be made only when it was commissioned. The size of the parchment, script used, any illustrations (thus raising the effective cost) and whether it was one book or a collection of several would be determined by the one commissioning the work. Stocking extra copies would likely have been considered wasteful and unnecessary since the form and the presentation of a manuscript were typically customized to the aesthetic tastes of the buyer. Due to the prevalence of manuscript caches, scholars today are more likely to find incomplete and sometimes conflicting segments of manuscripts rather than complete and largely consistent works. 77, no New Testament papyrus manuscript is complete; many consist only of a single fragmented page. Beginning in the fourth century, parchment (also called vellum) began to be a common medium for New Testament manuscripts. It wasn't until the twelfth century that paper (made from cotton or plant fibers), which was invented in first-century China, began to gain popularity in biblical manuscripts. Of the 476 non-Christian manuscripts dated to the second century, 97% of the manuscripts are in the form of scrolls; however, eight Christian manuscripts are codices. In fact, most New Testament manuscripts are codices. The adaptation of the codex form in non-Christian text did not become dominant until the fourth and fifth centuries, showing a preference for that form amongst early Christians. 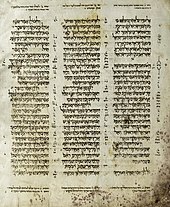 The considerable length of some New Testament books (such as the Pauline epistles), and the New Testament itself, was not suited to the limited space available on a single scroll; in contrast a codex could be expanded to hundreds of pages. On its own, however, length alone is an insufficient reason - after all, the Jewish scriptures would continue to be transmitted on scrolls for centuries to come. 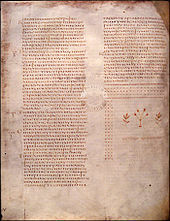 Scholars have argued that the codex was adopted as a product of the formation of the New Testament canon, allowing for a specific collections of documents like the Gospels and the Pauline Epistles. "Canon and codex go hand in hand in the sense that the adoption of a fixed canon could be more easily controlled and promulgated when the codex was the means of gathering together originally separate compositions." The New Testament books appear to have been completed within the 1st century. The original manuscripts of the New Testament books are not known to have survived. The autographs are believed to have been lost or destroyed a long time ago. What survives are copies of the original. Generally speaking, these copies were made centuries after the originals from other copies rather than from the autograph. Paleography, a science of dating manuscripts by typological analysis of their scripts, is the most precise and objective means known for determining the age of a manuscript. Script groups belong typologically to their generation; and changes can be noted with great accuracy over relatively short periods of time. Dating of manuscript material by a radiocarbon dating test requires that a small part of the material be destroyed in the process. Both radiocarbon and paleographical dating only give a range of possible dates, and it is still debated just how narrow this range might be. Dates established by radiocarbon dating can present a range of 10 to over 100 years. Similarly, dates established by paleography can present a range of 25 to over 125 years. Palaeography is the study of ancient writing, and textual criticism is the study of manuscripts in order to reconstruct a probable original text. None of the original documents of the New Testament is known to scholars to be extant; and the existing manuscripts differ from one another. The textual critic seeks to ascertain from the divergent copies which form of the text should be regarded as most conforming to the original. The New Testament has been preserved in three major manuscript traditions: the 4th-century-CE Alexandrian text-type, the Western text-type, and the Byzantine text-type, which includes over 80% of all manuscripts, the majority comparatively very late in the tradition. Since the mid-19th century, eclecticism, in which there is no a priori bias to a single manuscript, has been the dominant method of editing the Greek text of the New Testament. This is reflected in the Novum Testamentum Graece, which since 2014 corresponds to both the United Bible Society, 5th edition and Nestle-Aland, 28th edition. In textual criticism, eclecticism is the practice of examining a wide number of text witnesses and selecting the variant that seems best. The result of the process is a text with readings drawn from many witnesses. In a purely eclectic approach, no single witness is theoretically favored. Instead, the critic forms opinions about individual witnesses, relying on both external and internal evidence. Even so, the oldest manuscripts, being of the Alexandrian text-type, are the most favored in these two publications; and the critical text has an Alexandrian disposition. Most English translations of the New Testament made in the 20th Century were based on these copies. What is usually meant is that the New Testament has far more manuscript evidence from a far earlier period than other classical works. There are just under 6000 NT manuscripts, with copies of most of the NT dating from just 100 years or so after its writing. Classical sources almost always have fewer than 20 copies each and usually date from 700-1400 years after the composition of the work. In this regard, the classics are not as well attested. While this doesn't guarantee truthfulness, it means that it is much easier to reconstruct the New Testament text. Regarding genre, the Gospels are usually taken today to be examples of Roman biographies. Every year, several New Testament manuscripts handwritten in the original Greek format are discovered. The latest substantial find was in 2008, when 47 new manuscripts were discovered in Albania; at least 17 of them unknown to Western scholars. There has been an estimate of 400,000 variations among all these manuscripts (from the 2nd to 15th century). If you spread those 400,000 variations over 5,600 manuscripts, that comes out to only about 71 variations per manuscript, (400,000 divided by 5,600). And some of these manuscripts are the equivalent of several hundred pages of text, hand-written (see Codex Vaticanus, Codex Alexandrinus, et al.). The number of variants is additionally less significant than may appear since it is a comparison across linguistic boundaries. More important estimates focus on comparing texts within languages. Those variations are considerably fewer. The vast majority of these are accidental errors made by scribes, and are easily identified as such: an omitted word, a duplicate line, a misspelling, a rearrangement of words. Some variations involve apparently intentional changes, which often make more difficult a determination of whether they were corrections from better exemplars, harmonizations between readings, or ideologically motivated. Variants are listed in critical editions of the text, the most important of which is the Novum Testamentum Graece, which is the basis for most modern translations. For over 250 years, Christian scholars have argued that no textual variant affects key Christian doctrine. 37 is a fragment of the Gospel of Matthew containing nomina sacra. 1 is an early third century fragment of the Gospel of Matthew. Codex Vaticanus Graecus 1209 is one of the best available Greek manuscripts of almost the entire bible. 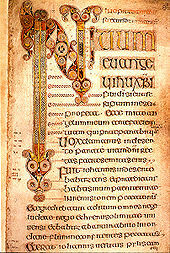 Uncial 0308 is a fragment of the Book of Revelation. ^ As a footnote to his comments, Metzger also said, "Lest, however, the wrong impression be conveyed from the statistics given above regarding the total number of Greek manuscripts of the New Testament, it should be pointed out that most of the papyri are relatively fragmentary and that only about fifty manuscripts (of which the Codex Sinaiticus is the only Uncial manuscript) contain the entire New Testament." ^ a b c d e Ehrman 2005. ^ "Codex Sinaiticus". Codex Sinaiticus Website. Archived from the original on 2008-12-31. Retrieved 2008-12-31. ^ "Seid". Retrieved 4 October 2014. ^ Metzger & Ehrman 2005, p. 3f. ^ "Waltz". Retrieved 4 October 2014. ^ Metzger & Ehrman 2005, pp. 3-10. ^ Kruger 2012, p. 249. ^ Kruger 2012, p. 250. ^ Elliott, J.K. (1996). "Manuscripts, the Codex, and the Canon". Journal for the Study of the New Testament (63): 111. ^ Metzger & Ehrman 2005, pp. 17-18, 20. ^ Hermann von Soden, Die Schriften des Neuen Testaments, in ihrer ältesten erreichbaren Textgestalt hergestellt auf Grund ihrer Textgeschichte 4 vols., Berlin: Glaue, 1902-1910. 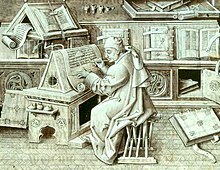 ^ "Britannica Online: Types of manuscript errors". Retrieved 4 October 2014. ^ F. V. Greifenhagen, Egypt on the Pentateuch's Ideological Map. ^ Ehrman 2004, pp. 479-480. ^ a b Willker, Wieland (17 April 2008). "Complete List of Greek NT Papyri". Archived from the original on 12 March 2014. ^ Philip W. Comfort and David P. Barrett. 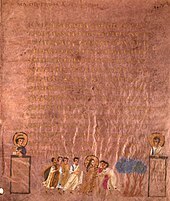 The Text of the Earliest New Testament Greek Manuscripts. Wheaton, Illinois: Tyndale House Publishers Incorporated, 2001, p. 65. ^ Aland, Barbara; Delobel, Joël (1994). New Testament textual criticism, exegesis and church history: a discussion of methods. Kampen: Kok Pharos. p. 138. ISBN 9-03-900105-7. ^ Ehrman 2004, p. 449. ^ Metzger 1992, pp. 33-35. ^ Metzger 1992, p. 34. ^ "The Reliability and Inspiration of the Bible". Dr. Habermas Answers Important Questions. ^ Vu, Michelle A (21 April 2008). "NT scholar on discovery of giant trove of Bible manuscripts". Christianity Today. ^ Wallace, Daniel (13 April 2009). "The Number of Textual Variants: An Evangelical Miscalculation". ^ Wallace, Daniel (3 June 2004). "The Majority Text and the Original Text: Are They Identical?". Retrieved 23 November 2013. ^ c.f. Bruce, F.F. "Are the New Testament Documents Reliable?" Aland, Kurt; Aland, Barbara (1995). The Text of The New Testament: An Introduction to the Critical Editions and to the Theory and Practice of Modern Textual Criticism. Translated by Erroll F. Rhodes (2nd ed.). Grand Rapids, MI: Wm. B. Eerdmans Publishing Company. pp. 40f, 72f. ISBN 0-8028-4098-1. Barkay, G., A.G. Vaughn, M.J. Lundberg and B. Zuckerman (2004). "The Amulets from Ketef Hinnom: A New Edition and Evaluation," Bulletin of the American Schools of Oriental Research 334: 41-71. (An innovation in the report was the simultaneous publication of an accompanying "digital article," a CD version of the article and the images). Bruce, F. F. (1964). "The Last Thirty Years". In Frederic G. Kenyon (ed.). Story of the Bible. Retrieved June 19, 2007. Kruger, Michael J. (2012). Canon revisited : establishing the origins and authority of the New Testament books (1st ed.). Wheaton, Ill.: Crossway. ISBN 9781433505003. Metzger, Bruce M. (1992). The Text of the New Testament: Its Transmission, Corruption and Restoration (3rd ed.). Oxford University Press. ISBN 0-19-507297-9. Metzger, Bruce M.; Ehrman, Bart D. (2005). The Text of the New Testament: Its Transmission, Corruption and Restoration (4th ed.). Oxford University Press. ISBN 0-19-516667-1. Herbermann, Charles, ed. (1913). "Manuscripts of the Bible" . Catholic Encyclopedia. New York: Robert Appleton Company.